Madonna ProActive features three pools along with expert staff to help each person take advantage of the physical and emotional benefits of water. From independent swimming to group aquatic classes to specialized aquatic therapy, Madonna ProActive provides a variety of ways to take advantage of all that the water has to offer. If you prefer water to land for your independent workouts, you will be delighted to take a dip in the brightly lit 25-yard Junior Olympic pool at Madonna ProActive. Floor-to-ceiling windows provide generous amounts of natural light, making your indoor swimming more pleasurable. You might also discover joy in one of the many classes offered each week. The low-impact benefits of water-based workouts are well-known, which is one reason many members turn to the custom-built warm water therapy pool and aqua track with its reverse current for individual and group workouts. When the temperature is right, the outdoor family pool is a great place to splash and relax. 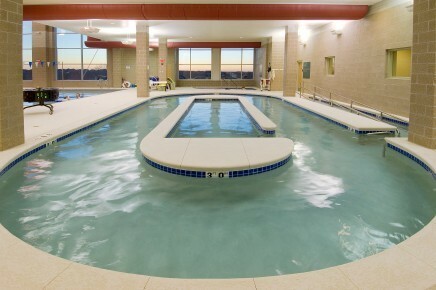 It's also an ideal place to swim laps during those humid Nebraska summer days! Whichever pool you choose, you can swim or exercise in a comfortable and relaxing environment knowing that a team of certified exercise instructors and aquatic therapists is ready to answer your questions and work with you to improve your overall health. This class focuses on movement, stretching and stability; an excellent class for those with multiple sclerosis or balance issues. This class will show you different ways to maintain correct postural stabilization with use of different equipment to engage and focus on the core. This class is designed for members new to fitness that need a low impact water workout. It is for all fitness levels and includes cardiovascular exercise, strengthening, stretching and balance work for a total body workout. This walking class involves going against and with the current as well as forwards, backwards and laterally in the Aqua Track and is beneficial for hip, knee or back problems and arthritis. This class is excellent for those individuals with back discomfort. The exercises are low impact and designed to strengthen the muscles around the back. This no current class focuses on range of motion exercises and stretches, along with balance and easing joint pain. This class is a zero impact workout and suitable for people with arthritis, fibromyalgia, bursitis and joint replacement. Total water workout of cardio, strength training, and flexibility exercises that varies each class. Total water workout of cardio, strength training, and flexibility exercises in the Aqua Track. This class is an intense workout that will challenge you and improve your body’s overall strength, fitness, balance, coordination and cardiovascular health. This class is an intensity level down from Power H2O. It will target your body’s overall strength, fitness, balance, coordination and cardiovascular health. This is a fast paced water workout that will get you moving with a challenging total body workout. This 15 minute class is designed for those wanting to focus on strengthening different muscle groups and ends with appropriate water stretches. Yoga moves in the water with a certified yoga instructor enable you to experience the benefits of yoga in a low impact water environment. Madonna ProActive offers different levels of lessons: water introduction, water safety and swim lessons. Never take your eyes off of children in the pool. Learn basic lifesaving and CPR for children and infants. Never dive in shallow water. Children under the age of 13 must be accompanied by an adult at least 19 years old and the adult must be in the pool area. Children 5 and younger must be supervised by an adult at least 19 years old and the supervising adult must be within arm's length of the child. Infants are required to wear swim diapers. Nerf and splash balls are allowed. US Coast Guard or Red Cross life jackets are allowed. Flotation devices, including water wings, are not allowed. Hard balls, such as tennis, golf, football, baseball,softball or racquetballs are not allowed. Coolers, outside food or beverages other than water should not be brought to the pool. Saturday & Sunday: 1-6:30 p.m.
*10-minute safety breaks will be held each hour of open swim. Please see the group exercise schedule for a full listing of open swim times. The air temperature must reach 70 degrees by 1 p.m. or the pool may close. The pool may not re-open if closed early. If the daily forecasted high is 75 degrees or below, please call ahead 402.420.0000.